They have a cheek. I’ve never been asked. 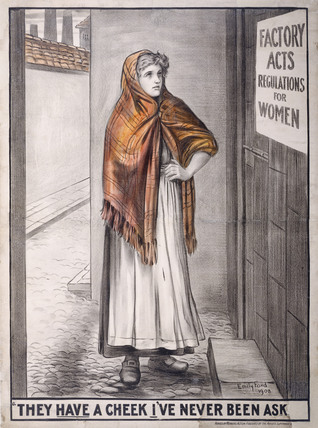 Printed & published by the Artists’ Suffrage League, 259 King’s Road, Chelsea. Sent to: Name and address unreadable. The postcard image is of a mill worker from the North of England in clogs and shawl (Tickner, 1987) reading a notice about the Factory Acts with the text ‘They have a cheek I’ve never been asked’. 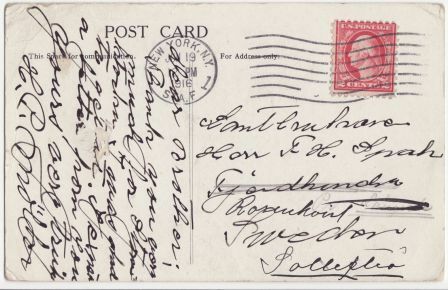 The postcard refers to a series of eleven factory acts which were enacted between 1847 and 1901 and regulated the employment and working conditions of women. Although the acts were intended to protect women in the workplace, the card is commenting on the fact that women were not consulted in the drawing up of the laws. This image was produced as a postcard and poster and was designed by Emily Susan Ford (1851-1930) and published in 1908 by the Artists’ Suffrage League. It was common for images to be printed on both posters and postcards; with the postcards being in black and white and the poster versions being hand-coloured (Crawford, 1999). Ford was a landscape and figure painter who studied at the Slade. With her sister, Isabella Ford, she was an active suffragist and active in the Leeds Suffrage Society. She was vice-chair of the Artists’ Suffrage League (Crawford, 1999). The Artists’ Suffrage League was formed in 1907 by Mary Lowndes and they designed banners, postcards and pamphlets. The colour poster version of the postcard appears in Tickner, Colour Plate III. Elizabeth Crawford (1999) The Women’s Suffrage Movement: A reference Guide 1866-1928. London: Routledge. Lisa Tickner (1987) The Spectacle of Women: Imagery of the suffrage campaign 1907-14. London: Chatto & Windus.